How do I use the Signatures function in SFP Connect? Drake eSignature is integrated into SFP Connect and allows only your 1040 clients to review and sign tax documents on their mobile device or computer. Second, sign with eSignature events. Download a signed PDF copy to Drake Documents. The SFP eSign process is different than using a Signature Pad to e-sign documents in your office. The SFP eSign process requires the purchase of eSignature events. Documents can only be signed via SFP Connect if enough signature events have been purchased and are available. Watch the video, SFP Connect Signatures, for a demonstration. In your browser, go to www.support.drakesoftware.com. Log into your support account. After agreeing to the Terms of Service, enter the number of events you wish to purchase. The current balance of events is displayed. The minimum purchase is 5 events. Bulk discounts are available for users wishing to purchase 10 or more Signatures at a time. See the Purchase eSignature Events section on the support site for details on available discounts. Note: The eSignature balance is also displayed when you click the eSign icon in view mode of a return. Each eSignature event is good for all the signatures in a single group of PDFs. Choose all of the PDFs that need to be signed before starting an eSignature event. 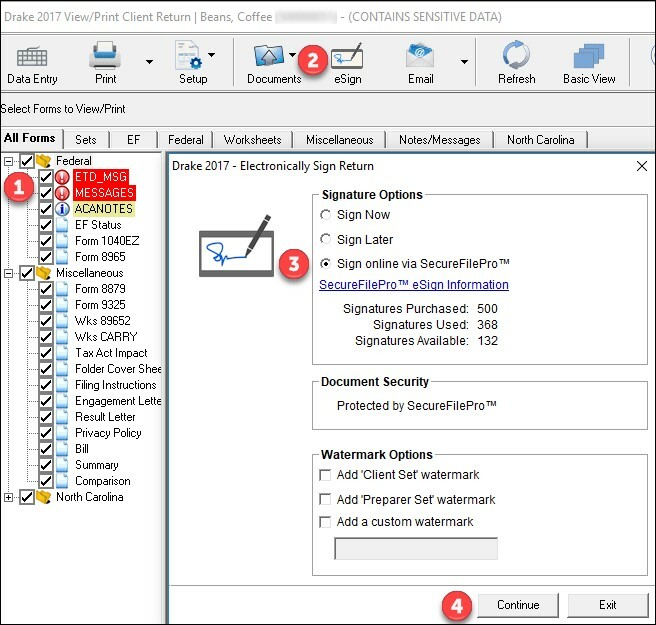 Every additional PDF that needs to be signed will use an eSignature event. If a document is not included in the group of PDFs, but later needs to be signed, that second signature will require another eSignature event. Note: For a list of documents that can be eSigned, see Related Links below. View the completed return and select the pages that should be included in the eSignature PDF. Select the radio button Sign online via SecureFilePro. If you do not have any eSignature Events available for use, the radio button will be grayed out. Click the link SecureFilePro eSign Information​ and log in to the Drake Software support website to purchase eSignature Events. You cannot choose to add a password to the upload as the document is already protected by SecureFilePro security measures. Optionally, you can add watermarks to the document. From the Save As window, save the unsigned PDF to Drake Documents or browse to a different save location. The File Upload Report displays to confirm that the upload was successful. If you are not already logged in to SFP in Drake Documents, you will be prompted to enter your SFP credentials before the document will be uploaded. After the file is uploaded, the taxpayer will receive an email notification that a signature document is available for review and signing. This email will contain a link and instructions for signing the document. If the client is not yet set up in SFP Connect, the email will also tell the client that an account has been created for them. Not Sent - Signature forms have not been sent to the taxpayer for review/signatures. Sent - Signature forms have been sent to the taxpayer for review/signatures. Signed - Taxpayer has reviewed and completed the signature process. Note: For more information on how to use the Connect Tab functions, see Related Links below. Note: The Delete button can be selected to delete an unsigned or partially signed Signature Document from SFP, however, this will not refund the eSignature Event. The Signatures tab displays a red exclamation point (!) indicating that an item needs review. The PDF is automatically saved in the Documents from Preparer folder. You can expand the Notifications section to view details by clicking on the arrow. Clear notifications by clicking on the red (X) under the Clear column. Select the folder Documents from Preparer. Click on the signed PDF. Drag and drop the PDF from the Documents from Preparer folder to the Documents pane. Click on Default File Expiration. Click on Latest File Transactions. In the For drop list, select Employees. In the File Name section, you will see a long file name including a section called SignableDocuments. For more details, click the View Folder button. This will allow you to see the actual PDF that was uploaded to the client. If you do not have an active SFP subscription, click the link Sign Up on the error window. An active SFP subscription is required to use the SFP features such as eSignatures. Verify the account number entered or enter your valid SFP Account number. Click Save and repeat the steps above to upload the Signature Documents. Once you upload a document to be eSigned by the taxpayer, they receive an email notification that there are documents to review and sign. If the taxpayer has not yet set up a portal login, the email will contain information and a link to set up their Portal as well as the instructions for signing the document. The link will be formatted as follows: https://DomainName.SecureFilePro.com/Connect where DomainName is the SFP domain name of the firm. The hyperlink must contain the /Connect or they will be logged in to the traditional SFP portal. Once the taxpayer creates and/or logs in to their SFP Connect web application, they will see a red exclamation point (!) 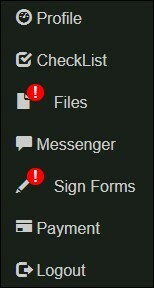 next to the Sign Forms menu showing that there are forms waiting to be signed. Note: Clients must be at least 18 years old in order to sign their federal tax return using the Drake Remote eSignature. Click Sign Forms from the menu on the left. Double-click on the document showing under Documents Available to Sign. The PDF document with signature fields opens. Scroll to the Your signature box (in yellow). 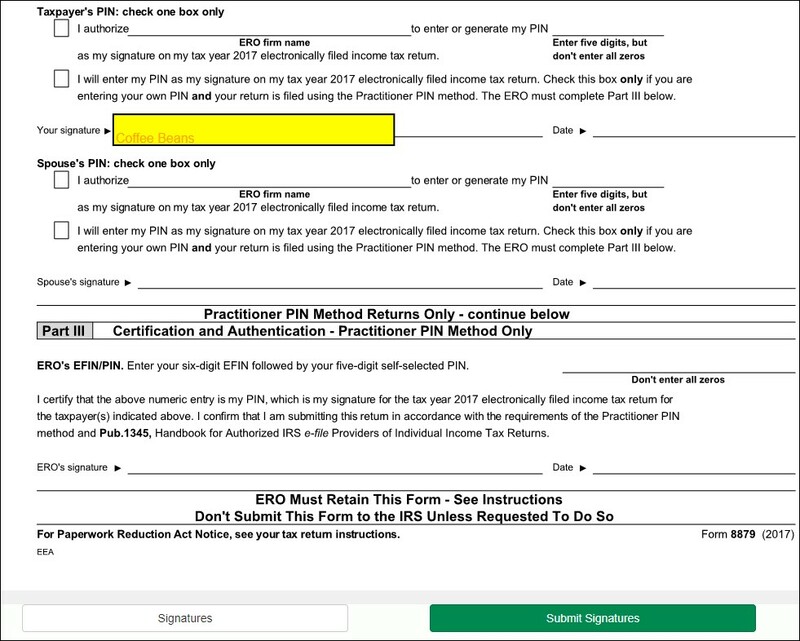 In this example, Form 8879 is being signed, so the taxpayer will scroll to Part II where the yellow box displays on the Your signature fields. Double-click on the yellow box to launch the "Knowledge Based Authentication" (KBA) process. This verification process is required the first time a taxpayer signs a document through SFP Connect. The taxpayer is presented with questions specific to their personal history, and they must correctly answer 4 out of 5 questions in order to proceed. Note: If the taxpayer does not pass the KBA in three attempts (correctly answering 4 out of 5 questions), they will no longer be eligible to eSign documents, which fulfills the IRS requirements related to capturing remote signatures. See Publication 1345 for details on IRS requirements. If the taxpayer successfully answers 4 out of 5 questions, another box appears that allows them to apply their eSignature to the form in each required field by using a mouse, stylus, or their finger. Note: If there is a secondary taxpayer (spouse) on the return, they must also complete the steps above. If there is only one taxpayer, continue below. 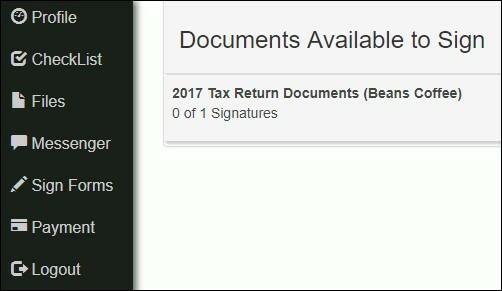 Once completed, click Submit Signatures (in green). After the taxpayer(s) have completed all signature fields and clicked Submit Signatures, the preparer receives notification in the SFP pane of Drake Documents. Married Filing Joint returns – Different Addresses: The current version of Drake Remote eSignature only supports a single household address for both taxpayer and spouse. The verification software must be able to match both taxpayer and spouse to the address in order to ask the appropriate Knowledge-Based Authentication (KBA) questions of the taxpayer and spouse. We recommend not using an eSignature Event when you are unsure if both taxpayers have ever lived at the address entered on the Name and Address screen in Drake Tax as eSignature Events are non-refundable. A future release will include a “Spouse address if different” option. System Requirements: Drake Remote eSignature is designed to work on iOS and Android devices, as well as Windows-based computers and Macs. We cannot guarantee that Drake Remote eSignature will work on all configurations, browsers, devices, platforms, and operating systems. Article has been viewed 8.1K times.